Because of the nature of distance education courses, the Office of Information Technology (OIT) computing and information services are vital to the success of online learners. This section covers contact information for Distance Education Services, the OIT Help Desk, and E-mail support. To visit the OIT website, please visit http://www.tamiu.edu/oit. For support in distance education, faculty and students may contact the eLearning team via phone at (956) 326-2792, via e-mail at elearning@tamiu.edu or by stopping by our offices located in Killam Library, Room 259. Please note the Distance Education support team is available for e-mail assistance 7 days a week. More information about services may be found at http://www.tamiu.edu/distance/. The Distance Education office provides an online chat support. The hours of operation are Monday-Friday from 8AM – 5PM. The OIT Help Desk provides computer-related assistance to students, faculty and staff of Texas A&M International University. The Help Desk is available for phone support at (956) 326-2310, via e-mail at hotline@tamiu.edu or on-campus in Killam Library, Room 257. Having a TAMIU student e-mail is vital for distance education learners. 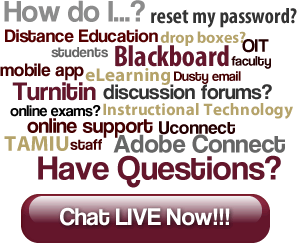 Apart from being the main form of online communication between faculty and students, the TAMIU e-mail is used to login to the eLearning platform (Blackboard) as well as access important information in Uconnect. To create an account, students can visit https://dusty.tamiu.edu/. Email accounts give students a hefty 25GB inbox with up to 25MB attachments, spam and virus filtering, ability to access on a mobile phone or desktop client, calendar sharing and much more!